FedEx recently announced that for the second year in a row, it won’t be applying a peak season surcharge on residential shipments. This is good news for retailers who expect a significant amount of e-commerce orders over the 2018 holiday season. UPS, however, will be instituting a surcharge on residential ground shipments from November 18 through December 1 and then again from December 16 through December 22. UPS will be charging $0.28 per package for most residential shipments using ground services. For UPS air services the fees are as high as $0.99 per package. UPS delivered around 700 million packages during the 2017 holiday season – a huge jump compared to the rest of the year. Ordering online has become so commonplace and easy for shoppers, and the carriers are feeling the effects. The increase in volume over the holidays drove UPS to introduce this new peak surcharge for the first time last year. Typically UPS and FedEx have comparable rates and surcharges and will mimic each other’s changes, so this is a notable distinction between the two small package giants. It’s important to note that both carriers are implementing charges on larger packages. With the rise of e-commerce, people are ordering items online that they would’ve exclusively purchased in-store in the past – including televisions and appliances. FedEx and UPS have made several adjustments to account for these trends, including a pushback on larger packages. Heavy and bulky packages don’t move through their automated systems and require more attention. FedEx and UPS are putting a price tag on that loss in efficiency and shippers need to stay aware. If you’re not careful, the surcharges can add up fast. 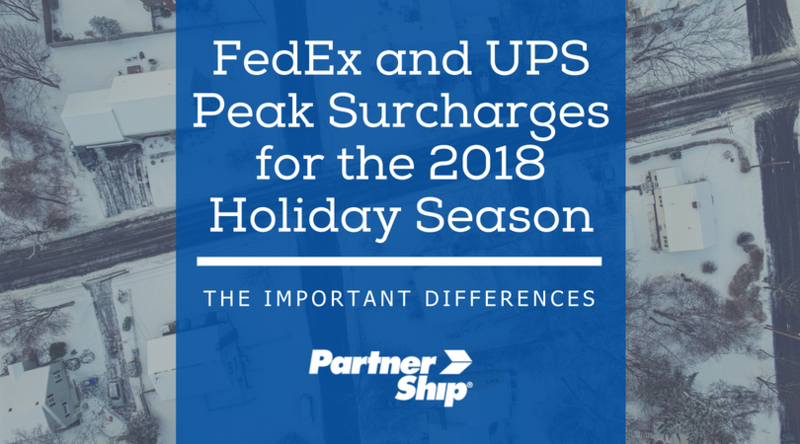 These peak surcharges are in addition to the already existing surcharges that apply to larger packages, and any others that may apply including delivery area and residential surcharges. Retailers should take note of these peak season changes to ensure a profitable 2018 holiday season. If you see a significant amount of online orders over the holidays and ship with UPS, you’ll be paying an extra $0.28 per package, which will eat into your bottom line. To prepare, take a look at what you shipped last year around the holidays and determine a forecast for this season. From there you’ll be able to see how much more you can expect to spend during the designated peak season. You may find that switching from UPS to FedEx for the busiest time of the year will provide you with a decent cost savings. Depending on the billable weight of your shipment and the destination, the base rate could be lower with FedEx – compounding the savings during peak season. It’s worth evaluating the options, when the holiday season can make or break your year. There are many factors to consider when deciding how to ship your small package shipments. You need an expert on your side. ParterShip manages shipping programs for over 140 associations, providing exclusive discounts on small package shipments to their members. To find out if you qualify or to learn how you can ship smarter, contact us today. FedEx and UPS rates will be going up after the holiday season! Make sure you know what to expect so you can mitigate the impact to your bottom line. Our free white paper breaks down where you'll find the highest increases and explain some of the complicated changes you need to be aware of.